Lourdes Rehabilitation and Healthcare Center as one of the best nursing homes for 2018-2019! In 1948 the Dominican Sisters of Oxford began caring for the elderly in their previous motherhouse nestled along the shores of Scott Lake — a stunning location reflecting the beauty of God's creation. Today, more than 60 years later, Lourdes Senior Community, a non-profit, continuing care retirement community, has grown into a neighborhood of 250 seniors living in four distinct residences: Fox Manor on the Lake independent living, Mendelson Home assisted living, Clausen Manor for those living with memory loss, and Lourdes Rehabilitation and Healthcare Center for long-term and short-term care. 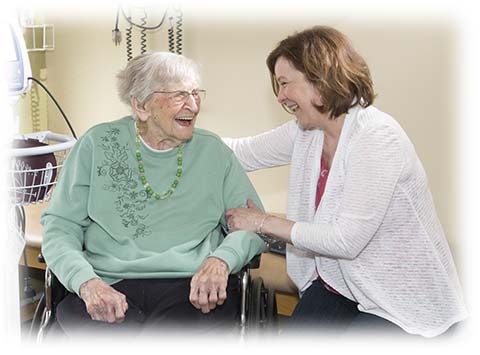 Lourdes Senior Community, inspired by the gospel of Jesus and sponsored by the Dominican Sisters of Peace, provides a broad continuum of care for seniors and their families. All who minister at Lourdes honor the uniqueness of each person with compassion, love, respect and dignity. There’s nothing like a best friend. Our childhood friends joined us for bike rides, walked with us to school and were our partners for endless shenanigans. As we grew older, they were our voice of reason, our shoulder to cry on and our source of advice. They stood next to us at our wedding, made birthdays special, and helped us through major life events. While the name of our best friend may have changed over the years, their importance remains the same. Best friends are a bright spot in our day, no matter our age or stage of life.